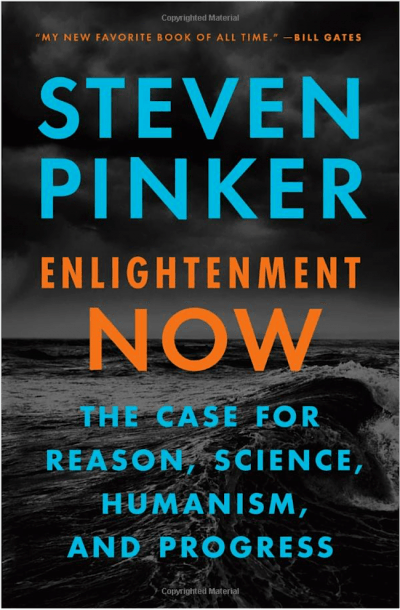 I just finished Steven Pinker’s latest book, Enlightenment Now, which turned out to be fantastic. I was frustrated in the first two-thirds of the book for reasons I won’t go into here (it seemed too positive while ignoring negatives), but the final several chapters were spectacular. Those chapters mostly focused on science and reason, and why they’re so important and our best path forward—despite being flawed in their own ways. 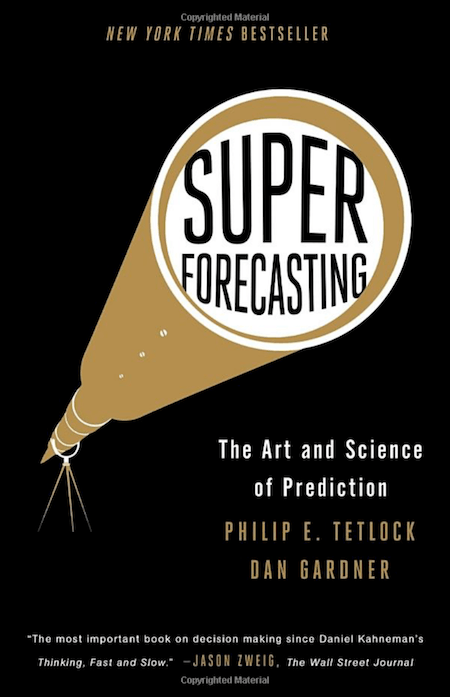 My favorite gem in the book was a section on what Pinker calls Super-forecasters, which was within a section of the book that talked about how bad we are at making predictions. Here are a few captures from that section. 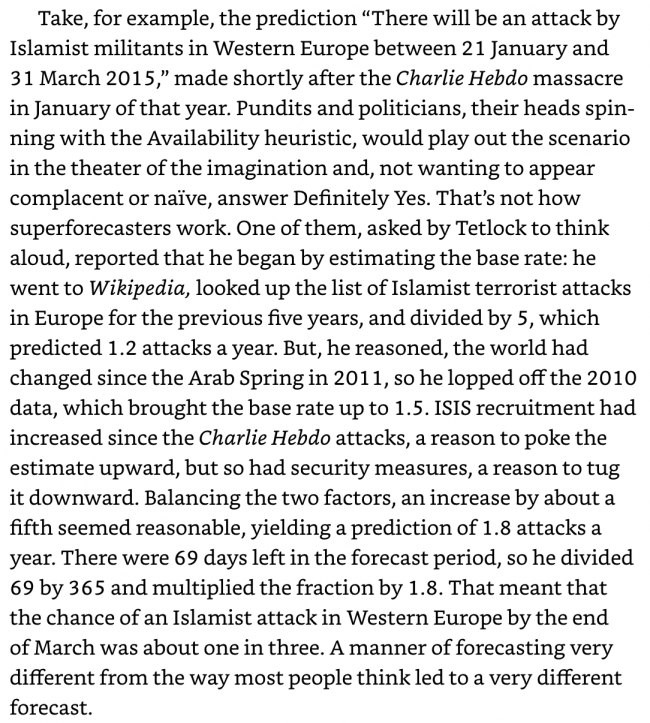 He talked about the work of Phillip Tetlock, a psychologist in the 80’s who did forecasting tournaments for hundreds of analysts, academics, writers, and regular people where he asked people to predict the likelihood of possible future events. In general, the experts did worse than regular people. And the closer to their expertise the subject was, the worse their predictions. But there were some who predicted far better than the loud and confident experts and the average person, which he called superforecasters. As for the belief in fate vs. chance question, Tetlock and Mellers rated people on a number of questions that gave them a Fate Score. Questions were things like, everything working according to God’s plan, everything happens for a reason, there are no accidents, everything is inevitable, the role of randomness, etc. An average American was (probably not anymore, I’m guessing) somewhere in the middle, an undergraduate at a top university scores a bit lower (better), a decent forecaster (as empirically tested by predictions and results) is even lower/better, and the super-forecasters scored lowest of all—meaning they thought the world was the most random! As someone who already holds a lot of these cautious, tentative views on reality, and who is willing to update them often, this felt good to read. It also reminded me to reinforce my own tendencies to doubt myself, and to be even more loose with my ideas. Overall the book turned out to be excellent, but this is the most powerful concept I’ll take from it. Most people are horrible at predictions, and most experts are even worse. The closer the topic is to their field, the worse the expert usually is at predictions. Top predictors have a particular set of attributes. They are high in Openness, they enjoy intellectual activity, they are comfortable with uncertainty, they distrust their gut, they’re neither left or right, they treat their beliefs as hypotheses, they are Bayesian, they believe in the wisdom of crowds, and they strongly believe in chance rather than fate. If you want to be better at predicting things, and generally not be the idiot that makes wild predictions that don’t come true, do your best to adopt and constantly reinforce these behaviors.